The editorial “Congrats Hon. 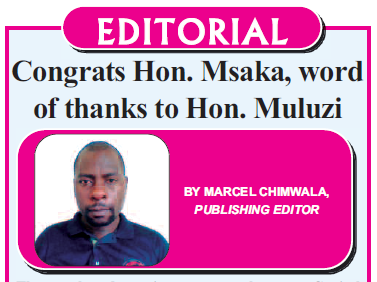 Msaka, word of thanks to Hon. Muluzi” featured below was initially published in Malawi’s Mining Review Issue Number 25, May 2015. The month under review saw some changes at Capital Hill whereby Ministers and Principal Secretaries were shifted to positions which His Excellency the State President Professor Arthur Peter Mutharika felt they will fit the most. The Ministry of Natural Resources, Energy and Mining was not spared in the changes. It received former Secretary to the President and Cabinet Honourable Bright Msaka SC as the new Minister replacing Honourable Austin Atupele Muluzi who was moved to the Ministry of Home Affairs and Internal Security. Mining Review joins the whole mining fraternity in congratulating Honourable Msaka on his appointment and also extends best wishes to Honourable Muluzi as he takes over the reigns at Home Affairs. We feel it is an opportunity for Honourable Muluzi who is familiar with security issues that may affect investment in the minerals sector to head the Ministry of Home Affairs. We, therefore, expect that the youthful charismatic minister who mesmerized us with his moving and inspiring speeches when he was at the Ministry of Natural Resources, Energy and Mining will hardly forget the minerals sector as he serves the country in his new role. Best Wishes Honourable Muluzi! For Honourable Msaka, this edition of Mining Review which is the biggest ever as it is filled with messages congratulating you upon being bequeathed with the new robes is a clear testimony of a grand welcome in the minerals sector. The sector is hoping to benefit from your rich experience as a career civil servant which saw you rising to the top position of Chief Secretary to the President and Cabinet. Your professional knowledge and understanding of the laws is another plus which we feel is vital as the Ministry is in the course of reviewing archaic pieces of legislation including the 1981 Mines and Minerals Act and we assume Professor Mutharika based on such merits to shuffle you to the Ministry. Congratulations Honourable Msaka!